MAGNE//FLO IMPACT WEIGHER FOR 1T/HR DUST & FINES. Impact weighers or impact style mass flow meters are very useful for measuring tonnages of dry free-flowing solids and particulates and even powders where belt scales cannot be used (eg: out-loading from silos; any situation where there is simply no room for a horizontal conveyor; or where the plant design precludes the use of a belt conveyor). However at low flow rates (eg: below say 10 tonnes/hour) belt scales become at worst unreliable or difficult to implement as the tare weight of the belt becomes a significant fraction of the total weight on the belt. Some ingenious designs have been developed to overcome this inherent limitation of belt scales. But as designs become more complicated so the cost increases and it becomes more difficult to justify the measurement at all. 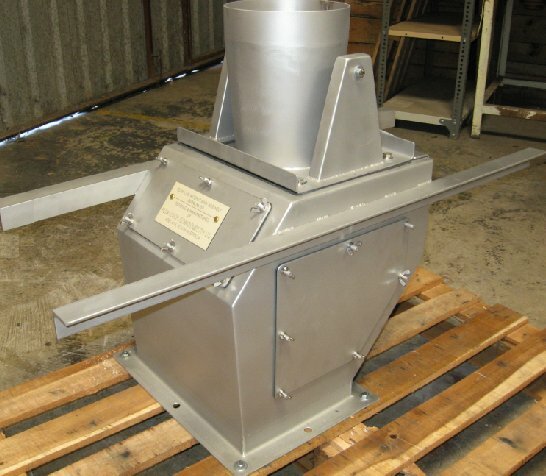 The solution in many cases is to use an impact weigher sized for the low flow rate. There is no tare weight to worry about with an impact weigher so generally an impact weigher can be used down to 1 tonne/hour with no increase in complexity or cost compared with medium flow rates (eg: 50 t/hr). Incoming Process Feed: A low volume plant using high value material needs to closely monitor the quantity of material used in the process. The material is conveyed into the process from bulk storage via specially sealed non-belt type conveyors operating at 1 t/hr. Recycling cement kiln dust: The need to reduce dust emissions and improve efficiency are continuing to encourage cement manufacturers to reuse process-generated dust rather than allowing it to go to waste. The kiln dust is collected and recycled at flow rates down to 1 t/hr. The recirculating feeders are typically speed controlled to regulate the flow rate as needed. So an impact weigher is useful to provide the rate signal to the motor speed controller. Recycling pet food dust: The need to optimise the pelletising of pet food to minimise the amount of dust & grit in a bag of pet food is partly driven by customer expectations of good value for money; and partly by the manufacturer’s desire to minimise costs and waste. Dust and grits can be separated from the product prior to bagging and recycled for collection and reuse. However the quantity of dust recirculated needs to be monitored in real time so that the operator can adjust the pelletising plant as needed before making the next batch. Depending on pelletising performance the rate of dust recycling that needs to be measured can be as low as 1 t/hr. The photograph below shows the new MAGNE//FLO impact weigher designed for low flow rates. It features an extended suspension system for the impact plate that allows greater sensitivity than otherwise.